There is a turf war between those who favor thermography and those who favor mammography for early breast cancer detection. The mammogram party is supported by federal health agencies and non-governmental organizations (NGOs) as well as the mammogram industry. For the most part, the under-supported thermography advocates are outgunned and outnumbered by the mammogram crowd, which has declared a soft, at least for now, war on thermography to restrict or deny its independent breast cancer screening use. Breast cancer cells take around five to eight years to develop enough for mammogram tumor detection. Just in time for costly, profitable treatments. But because of thermography's extreme sensitivity to infrared emissions from slight temperature variations, its images render the earliest signs of breast cancer and/or a pre-cancerous state of the breast. In the detection of breast cancer ,the following information would be useful for those considering thermography. 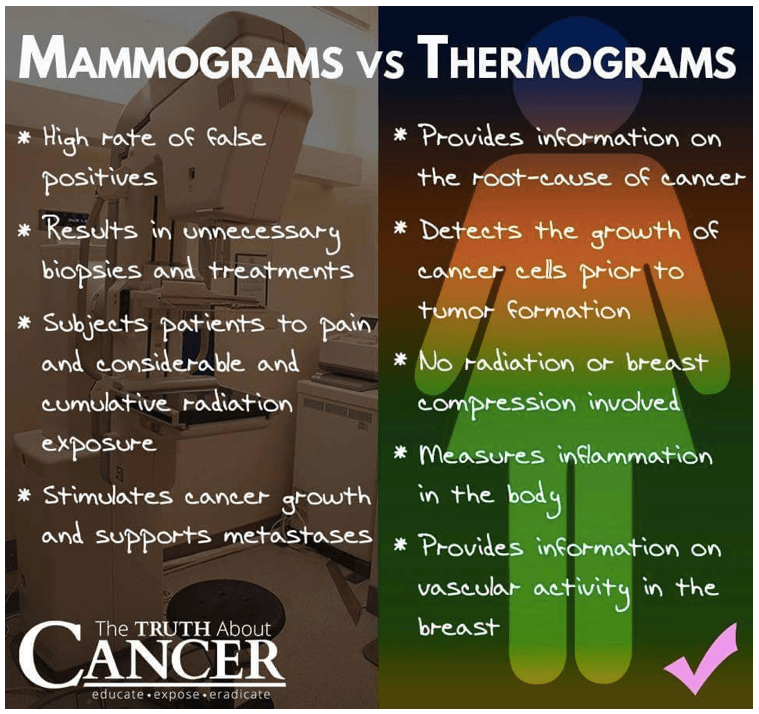 What is the sensitivity of thermography v mammography ? What is the specificity of thermography v mammography.? How many screened by thermography also have mammograms ? What is the biopsy rate in lesions detected by thermography.? What is the false +ve rate and the false -ve rates in thermography. what is the interval cancer rate in thermography.? What is the recommended screening interval in thermography.? Is thermography better at detecting axillary (arm pit) nodes than ultrasound ? In which journals can I review the scientific papers confirming that thermography .has a better detection rate in early cancer than mammography.